In an interesting move, the Weather Channel Companies has added Andy Miller to its board. While such adds are not usually the biggest of news, the appointment of the high-profile former CEO and co-founder of mobile advertising firm Quattro Wireless as a director is an interesting early move by new CEO David Kenny. It makes sense, given that so many more people will be increasingly accessing all kinds of weather info — including video — on their mobile devices rather than the Web. Expertise in mobile advertising, then, will be key. Miller, as you might recall, sold Quattro to Apple for $275 million in 2010, and became its head of mobile advertising before leaving that post last year. At Apple, he headed up the iAd division, which is the mobile advertising network for the iPhone, iPod touch and iPad. He is now at the venture firm Highland Capital Partners. ATLANTA — March 8, 2012 — The Weather Channel Companies (TWCC) today announced the appointment of Andy Miller to its board of directors. Miller, a general partner at Highland Capital Partners, is a mobile expert and visionary entrepreneur who led mobile advertising at Apple and was the co-founder and CEO of Quattro Wireless. As a general partner at Highland Capital Partners, Miller is focused on identifying and working with the most promising technology companies in Silicon Valley. He currently represents Highland on the boards of Digg, Game Closure and Impermium. 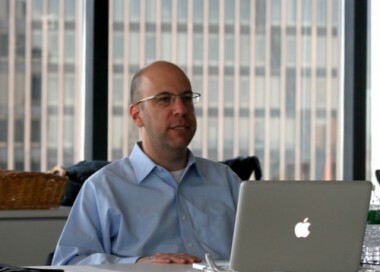 Miller joined Highland from Apple Inc., where he reported directly to Steve Jobs and was vice president, mobile advertising. At Apple, he headed up the iAd division, the mobile advertising network for the iPhone, iPod Touch and iPad line of mobile devices. Previously, Miller was the co-founder and CEO of Quattro Wireless, the mobile advertising company that was acquired by Apple in 2009. Prior to that, he had responsibility for business development, sales and strategy for what became North America’s dominant mobile aggregator, mQube, which was acquired by VeriSign in 2006. Miller has also held the position of CEO of WatchPoint Media, an MIT Media Lab interactive TV spinoff, that was sold to Goldpocket/Tandberg Television in 2003. Miller has a bachelor’s degree from Union College and a J.D. from Boston College Law School. He lives in the Bay area with his wife and two boys. An avid baseball fan, he is a co-owner of the Colorado Rockies Advanced Single A franchise, the Modesto Nuts.